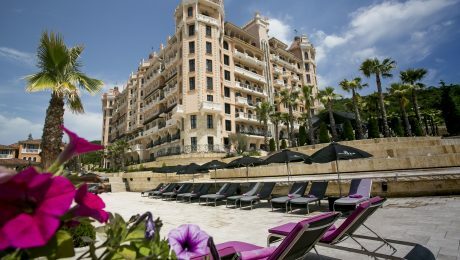 We would like to inform you that Hotel Royal Castle Design & SPA will be temporarily closed for maintenance during the winter season. 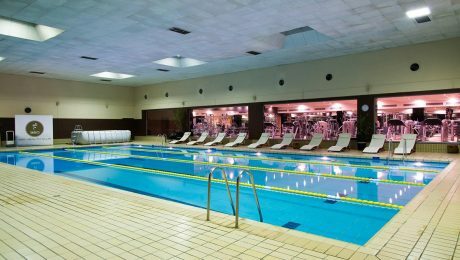 The hotel will be available for bookings from 15.05.2019. 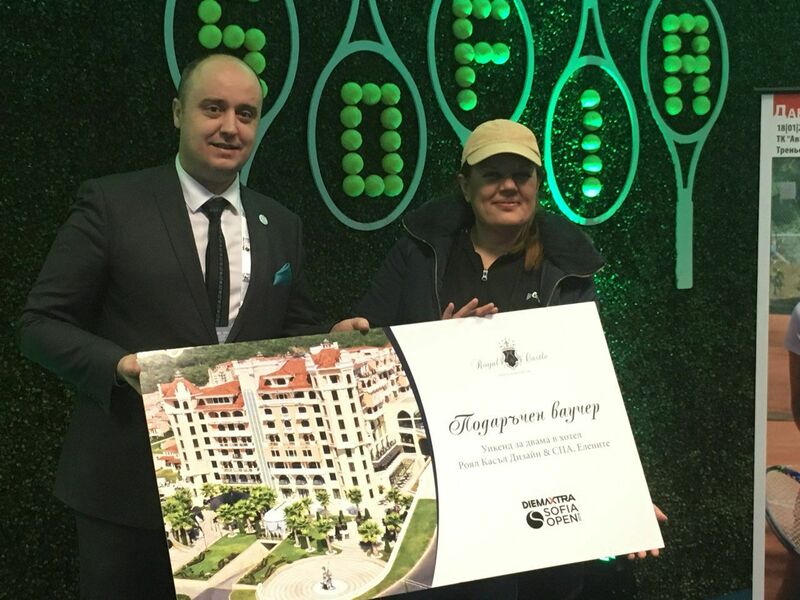 During the event of the twelfth anniversary of one of the of the most prestigious awards in the filed of international luxury tourism – the organization World Luxury Hotel once again awarded the emblematic Hotel Marinela Sofia. 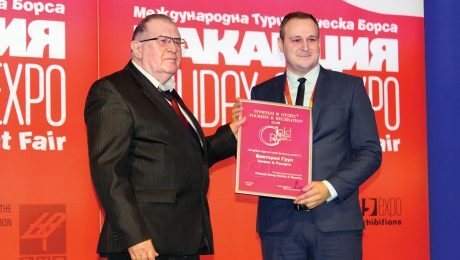 The recognition achieved this year by five-star Hotel Marinela Sofia is “Luxury Diplomatic Hotel” of 2018. 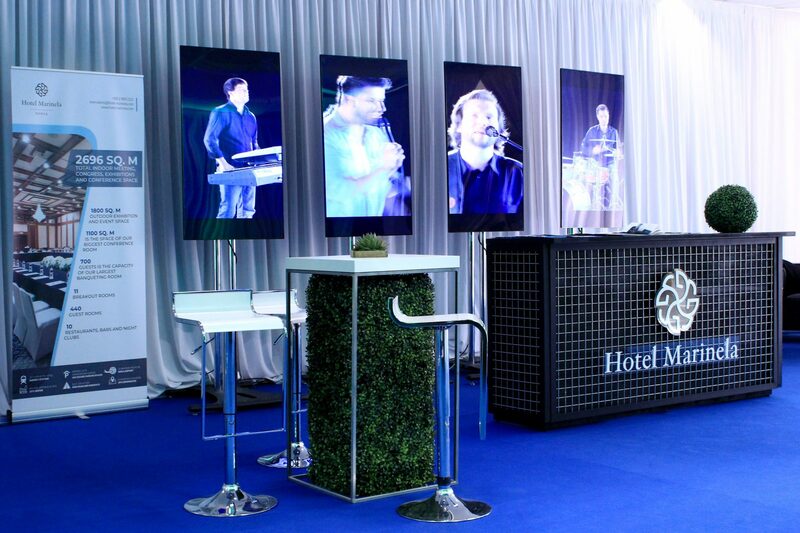 In 2016 and 2017 the hotel was awarded as the “Luxury Business Hotel”, “The Most Luxurious Brand in Eastern Europe”, “The Most Luxurious Hotel and Conference Center” and “The Most Luxurious Business Hotel “. The ceremony took place on the exotic island of Bali – one of the most popular tourist destination in recent years. Representatives from more than one hundred countries participated in the annual competition. The World Luxury Hotel Awards is a recognized global organization providing luxury hotels with recognition for their world class facilities and service excellence provided to guests. 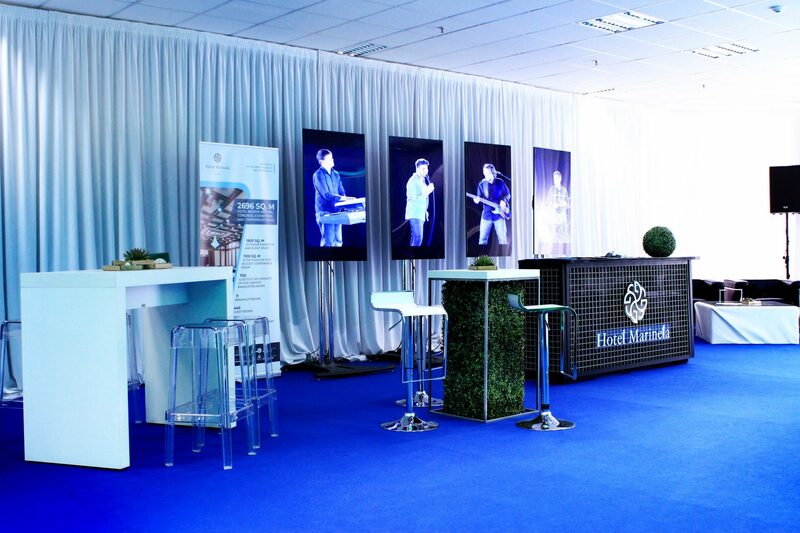 Despite the huge competition, Hotel Marinela Sofia received another recognition from the prestigious forum. 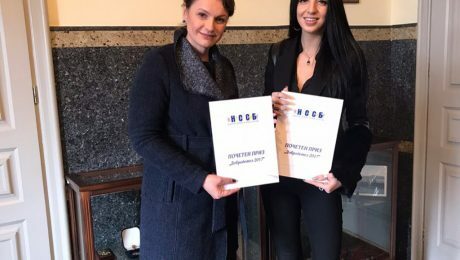 The award for Hotel Marinela Sofia comes after the arrival of the European political and diplomatic elite during the rotating presidency of Bulgaria at the Council of the European Union in 2018. Among the guests of the hotel were European Council President Donald Tusk, European Commission President Jean-Claude Juncker, President of the European Parliament Antonio Tajani, High Representative of the Union for Foreign Affairs and Security Policy Federica Mogrini, and many others. 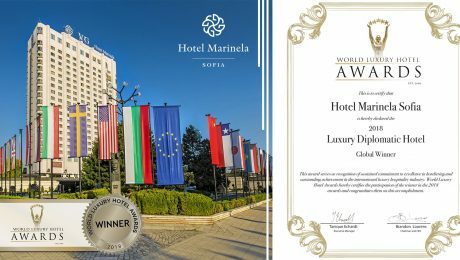 The team of Hotel Marinela Sofia is grateful for the World Luxury Hotel’s high recognition and holds out the promise to carry out the mission of taking care of its guests according to the highest criteria in the segment of world luxury tourism. 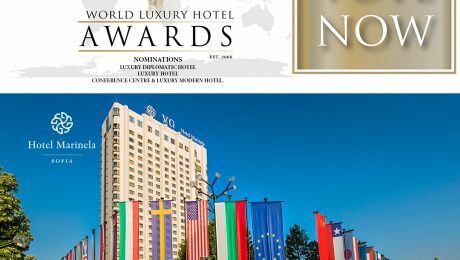 For third consecutive year, Hotel Marinela Sofia will take part in one of the most prestigious international awards – World Luxury Hotel Awards and will be positioned among the most luxurious hotels in the world with three nominations – Luxury Diplomatic Hotel, Luxury Hotel & Conference Centre, Luxury Modern Hotel. World Luxury Hotel Awards is the pinnacle of excellence in the luxury hotel business sector, offering international evaluation, voted by guests, tourists and industry participants. In 2016, Victoria Group’s crown jewel was awarded for the World Luxury Hotel Awarad at the Luxury Business Hotel category at an official ceremony in Doha and ranks among internationally renowned hotels, such as the Armani Hotel in Milan, the Kempinski Hotel in Doha and many other world-famous brands in the tourism business. 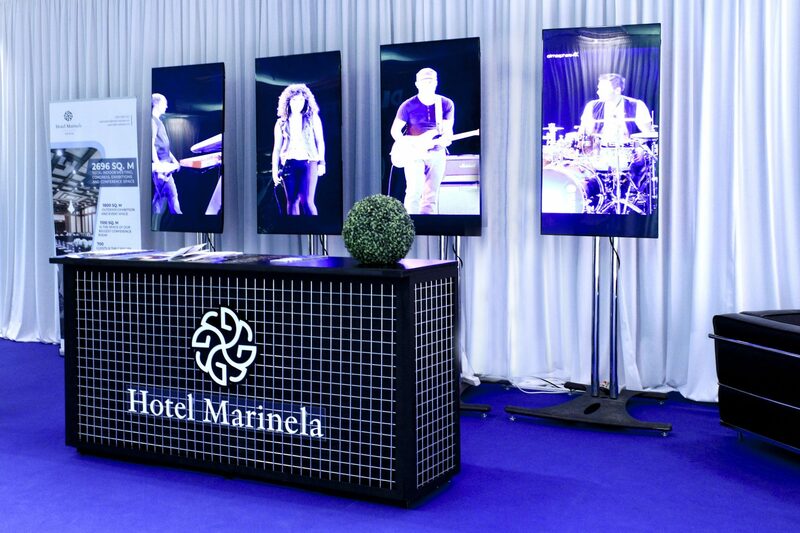 In 2017 Hotel Marinela received three World Luxury Hotel Awards, for respectively: the most luxurious brand in Eastern Europe, the most luxurious hotel and conference center the most luxurious business hotel in 2017. 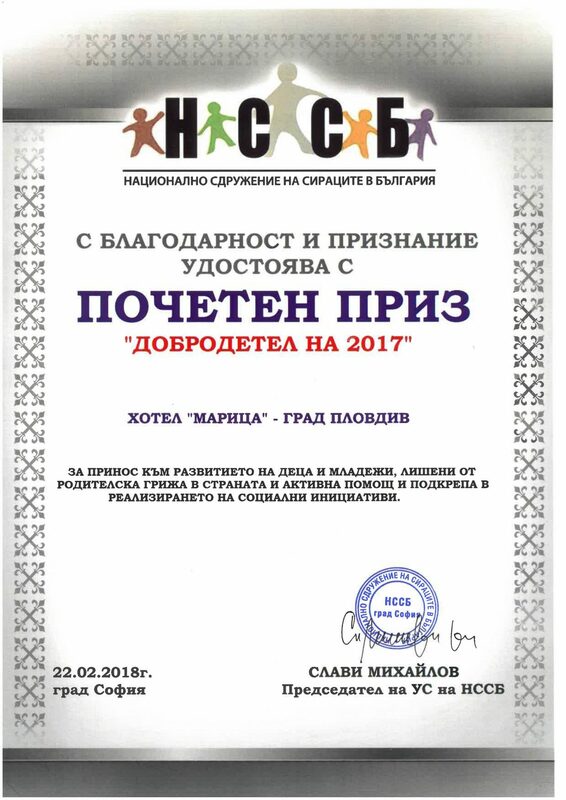 Marinela Association and two of the hotels from the largest tourist holding Victoria Group Hotels and Resorts – the five-star Marinela Hotel and the Maritza Hotel in Plovdiv were awarded with the “Virtue of 2017” at an official ceremony at the Central Military Club organized by the National Orphan Association in Bulgaria. 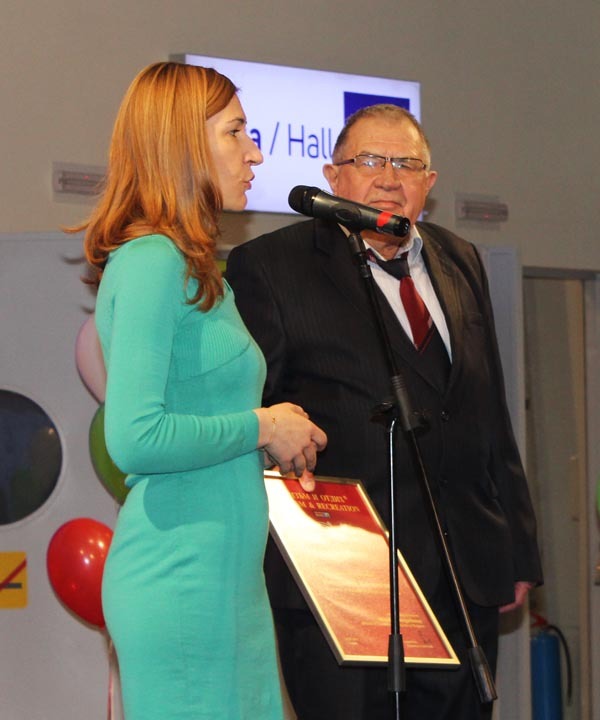 The award was handed to the administrative director of the Marinela Association, Angelina Angelova by Slavi Mihaylov, chairman of the National Orphan Association in Bulgaria, who thanked for the support and partnership in 2017. 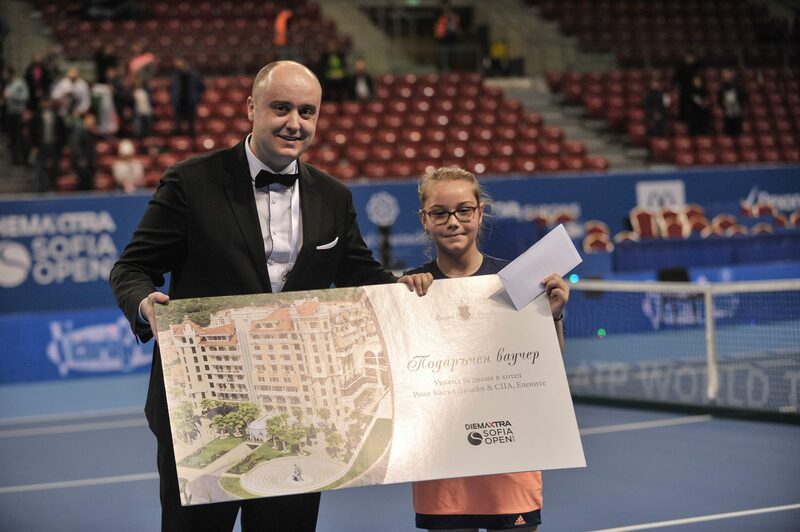 Marinela and Victoria Group Hotels and Resorts were general partners of the “Vacation without Borders” initiative and provided support and cooperation for a number of initiatives of the National Orphan Association in Bulgaria. 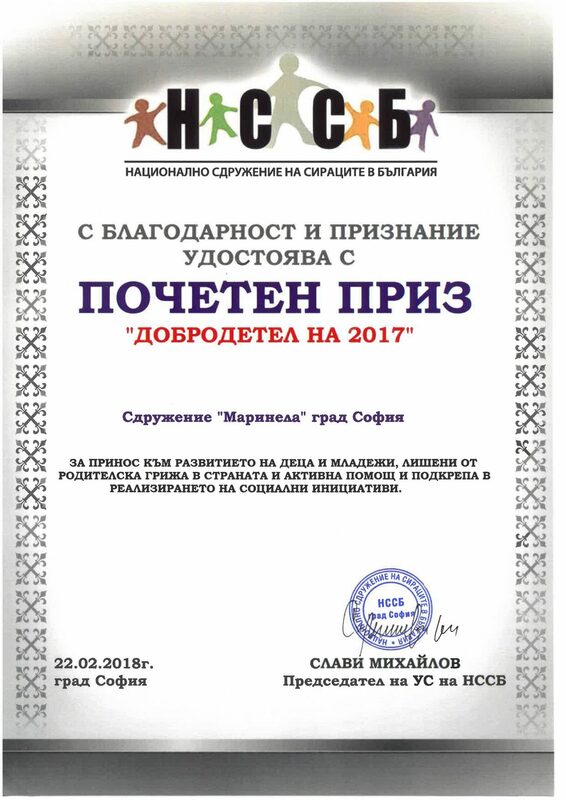 This is another recognition for the association, as well as for the tourist holding, managed by Marinela Arabadjieva. 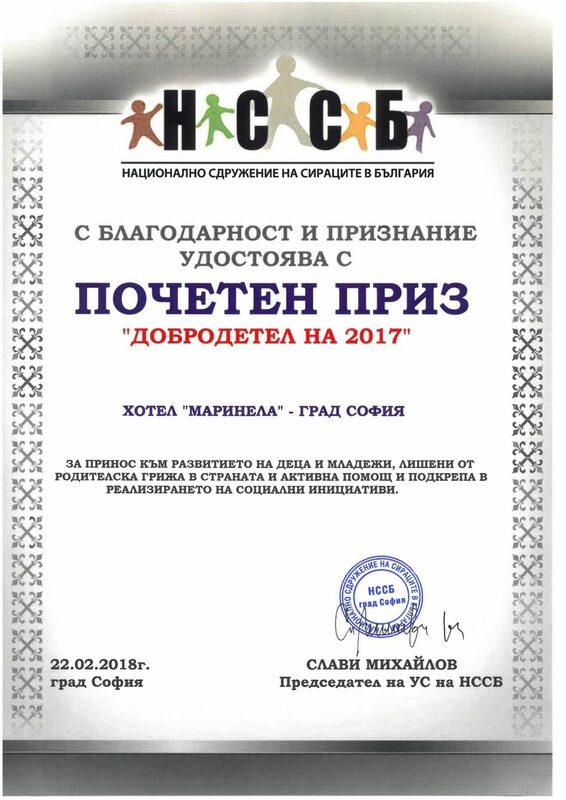 At the end of 2017, Marinela Association was awarded the Golden Heart award for a full social commitment to an equal start for all children and a few days ago the Victoria Group Hotels and Resorts received the Best Tourism Company Award for 2017 “. 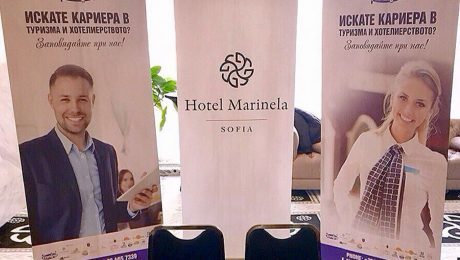 This Saturday and Sunday (16 and 17 February 2018) in Hotel Marinela Sofia was held the forum for education abroad “World Education”, organized by Integral. 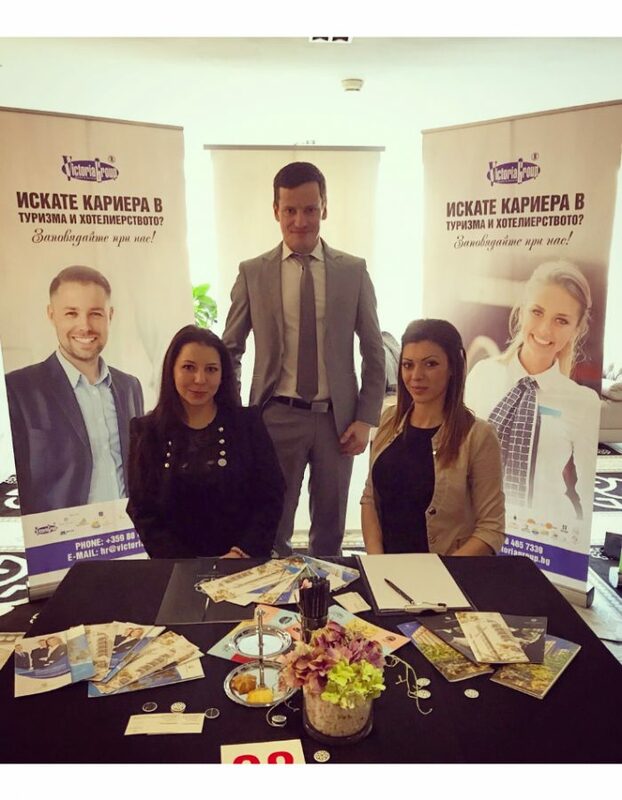 Victoria Group Hotels and Resorts were presented in the section “Career Center”, and all those interested were informed of the opportunities for Internships. 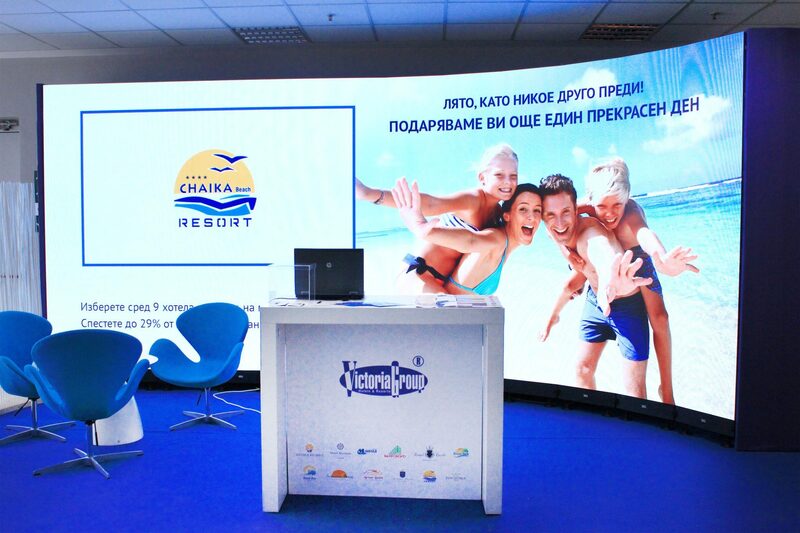 The company’s large portfolio, as hotels and locations, offers opportunities for practical internships in major cities – Sofia and Plovdiv, as well as in the seaside resorts – Sunny Beach and resorts. Elenite, even an alternative for the winter in Pamporovo. The stand enjoyed tremendous interest both from students and students, as well as from candidates with previous experience in other areas. Victoria Group Hotels and Resorts received the “Golden Prize” for “Best Tourism Company for 2017” by Tourism and Recreation Magazine. 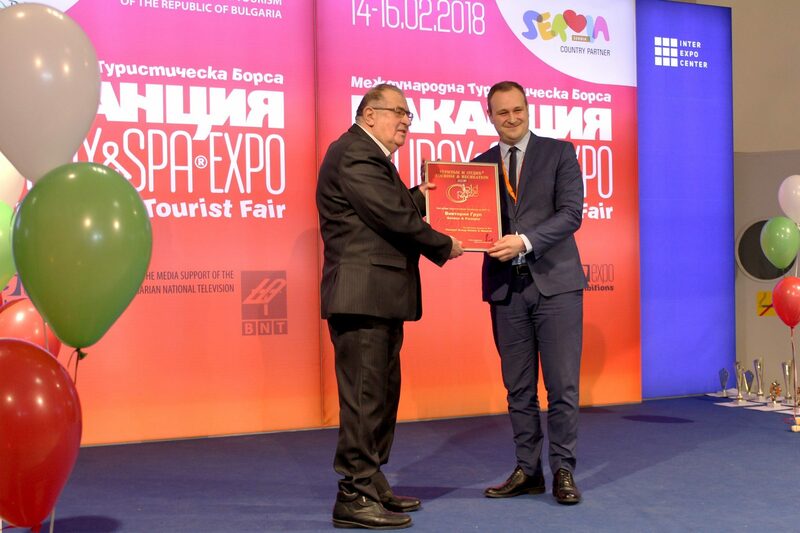 The edition presents the prestigious awards for the thirteenth time, distinguishing the leaders who have contributed to the development of tourism in Bulgaria. 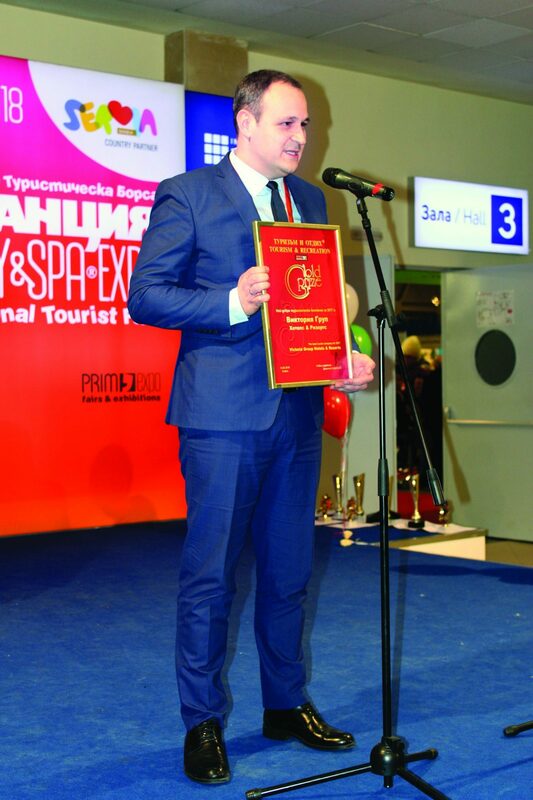 Today, at the 25th International Tourist Excursion, “Holiday & SPA Expo, under the patronage of the Ministry of Tourism, the prize was awarded to Svetoslav Georgiev, Victoria Sales Group Sales, Marketing and Development Director. 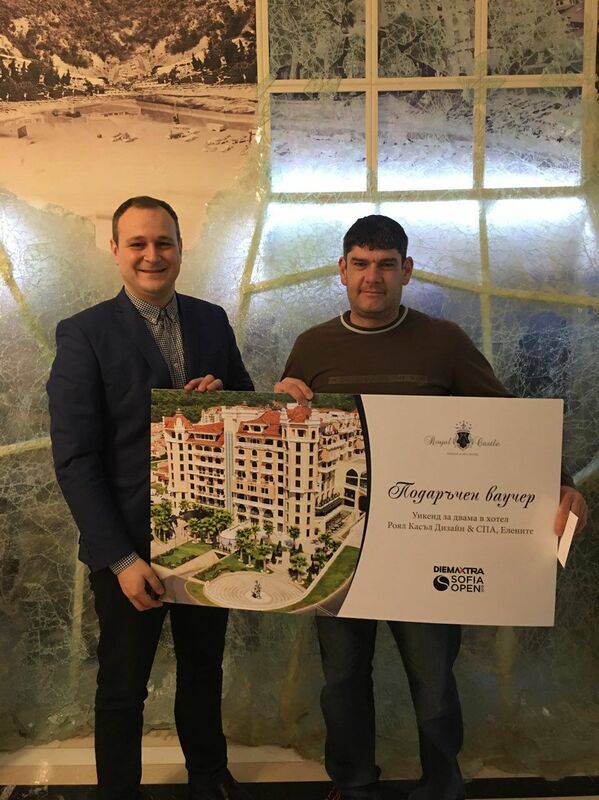 He invited all those present during the forthcoming summer season to visit Hacienda Beach’s newest hotel in Sozopol. 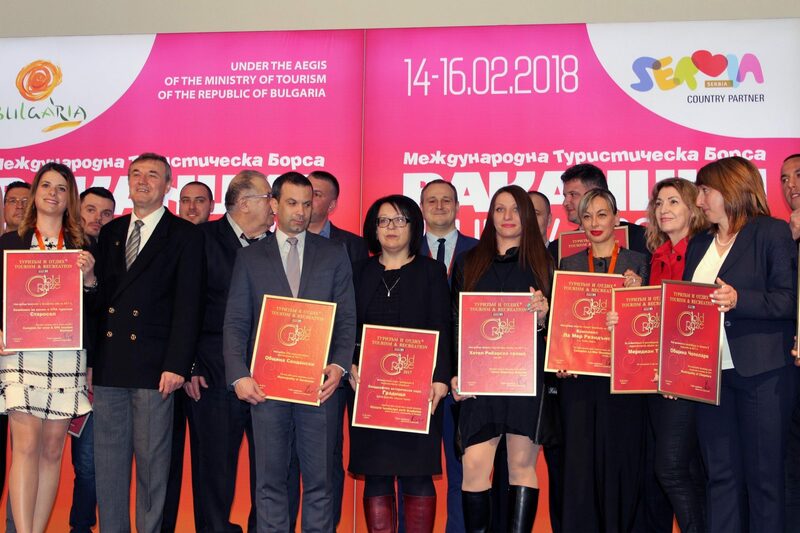 The criteria according to which have been defined nominated companies are high culture of service and professional management – factors which promote Bulgaria as an attractive tourist destination. This award is another proof of the leadership position of Victoria Group Hotels and Resorts in the industry. 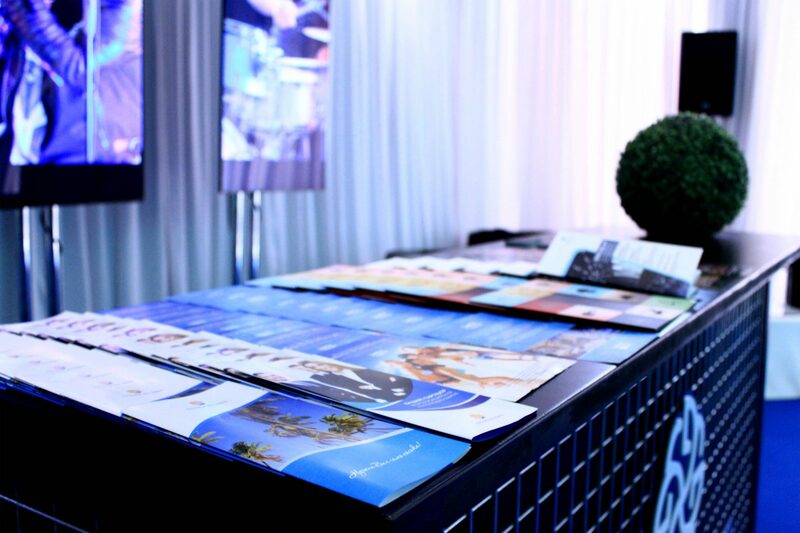 Established in 1996, the holding is the largest hotel operator in Bulgaria with a portfolio of 4 and 5 star hotels in the top destinations of Bulgaria and with key partnerships with the world’s largest tour operators. 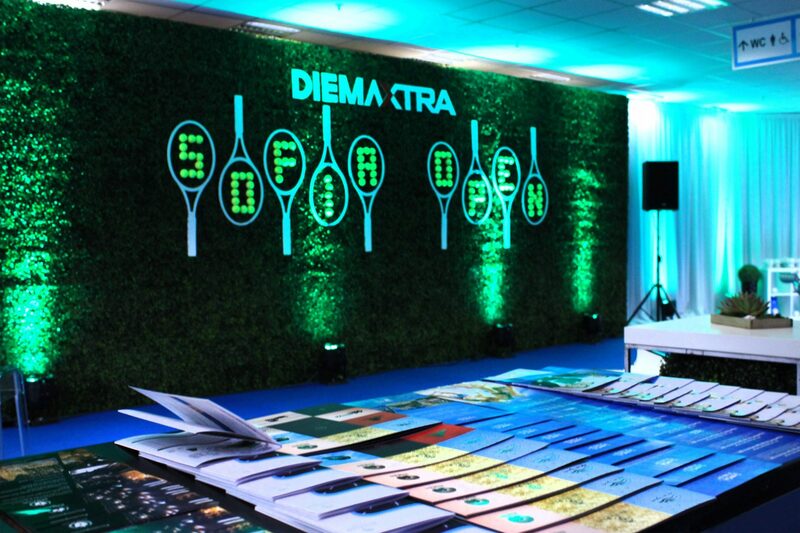 During the tennis tournament Diema Xtra Sofia Open 2018 in Arena Armeec an interactive stand of Victoria Group, Victoria Holidays and Hotel Marinela welcomed its guests. 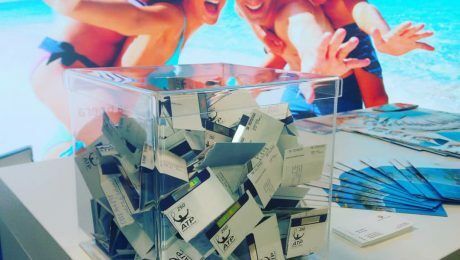 The lucky winners of the raffle Radka Filimonova, Diana Petrova, Mladen Hubenov, Sika Milenova and Ivan Nikolov won a weekend for two at the designed five-star Royal Castle Design & Spa Hotel. 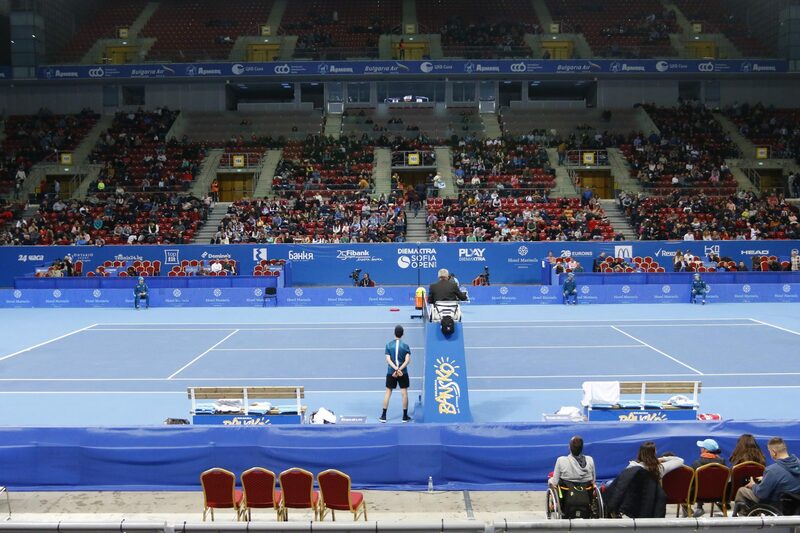 Around 40,000 spectators witnessed the attractive tennis matches at the prestigious tennis tournament in Sofia. 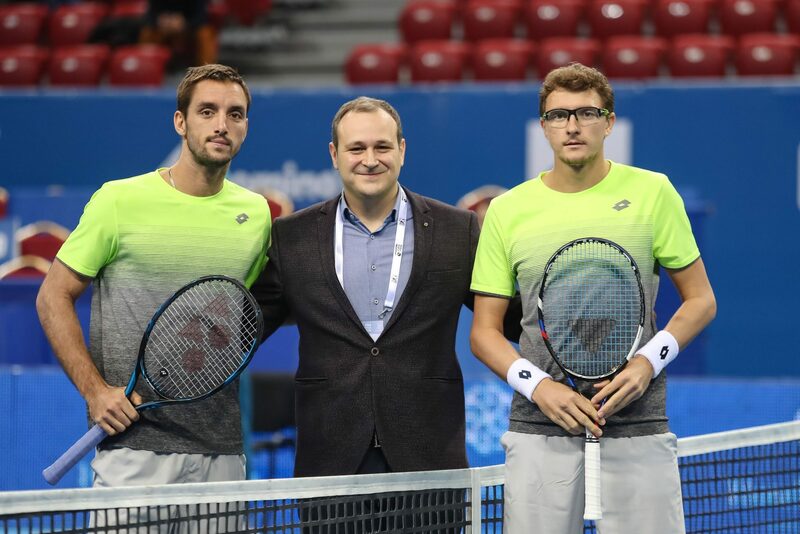 Eight of the most promising talents girls and boys aged between 9 and 10 competed for Mini Sofia Open 2018, also part of the Diema Xtra Sofia Open 2018 tennis tournament. ThTitle in girls won Gabriela Georgieva TC “Asenovgrad” and Ivan Ivan “TK Spain” from Varna was the winner for the boys. 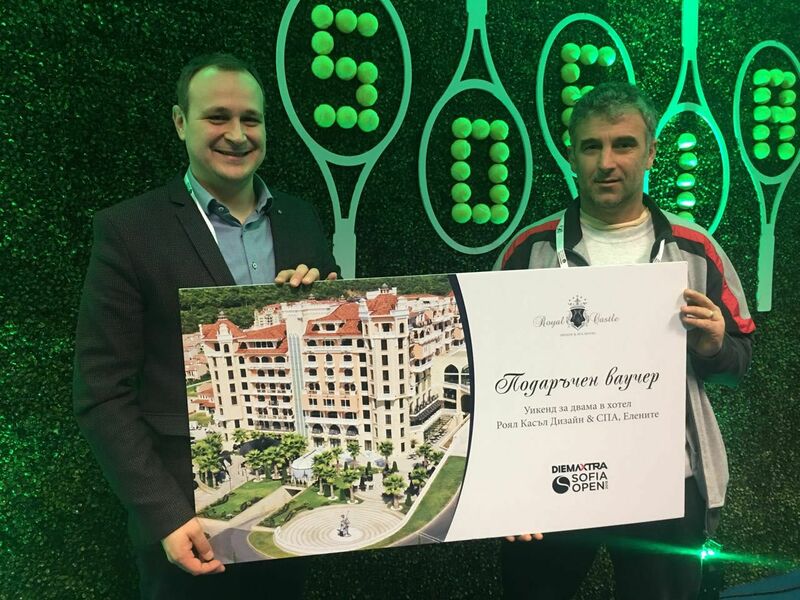 Marketing Director Svetoslav Georgiev and Regional Director Plamen Hutov of Victoria Group Hotels & Resorts awarded the young tennis hopes with a weekend for them and their families at the five-star Royal Castle Hotel and Royal Casa Villas. 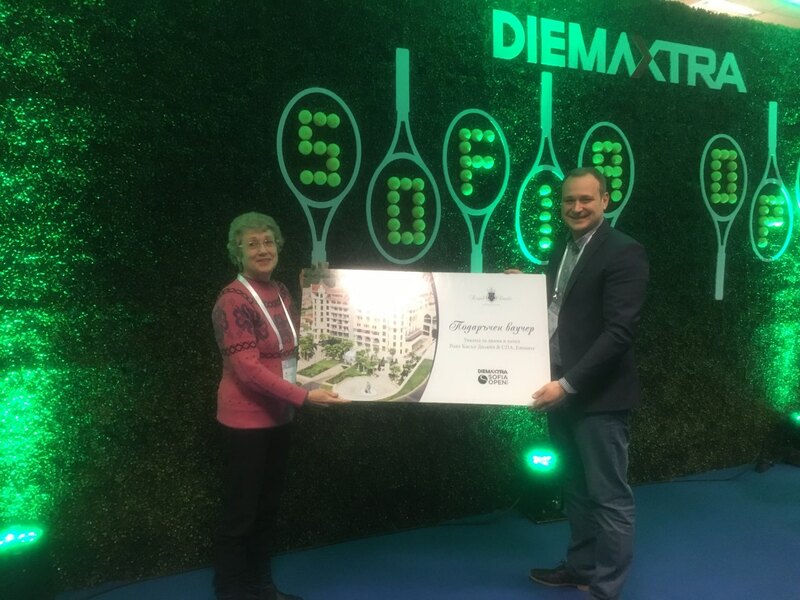 Tennis Director Paul McNammy sincerely thanks Ms. Marinella Arabadjieva for the partnership and support of Bulgarian tennis. The business lady also runs its charity, the Marinela Association, which has supported dozens of sports forums throughout the country over the past year and aims to support gifted children in different areas and motivate them to develop their talent. 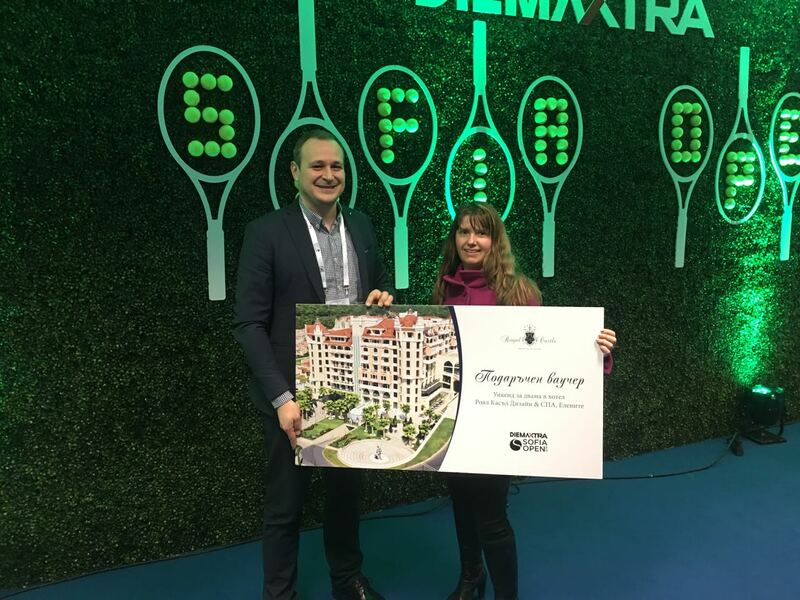 Тук може да следите имената на победителите от томболата на Victoria Group Hotels & Resorts по време на Sofia Open 2018. Hotel Marinela Sofia welcomes 5 interns from Lithuania in Kitchen Department in the next 3 months, as part of the Erasmus + program for students exchange. 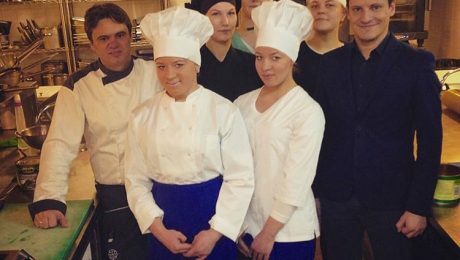 The trainees will be in Hot / Cold Kitchen and Pastry, and will have the opportunity to work under the direct supervision of Chef Andrey Stoilov, Executive Chef for Victoria Group Hotels.